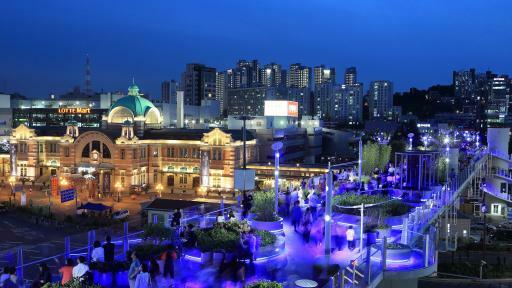 (Seoul, Korea) - Most of us are living in a city. Actually we do not have much time to walk around the city. Even though when we are willing to walk especially on a beautifully sunny day, we often fail to find a good place for a walk. However, the cities are changing now. “Walkable Urbanism” has been emerging as a new global standard for urban development. There was a time when wide roads and fast traffic were regarded as key elements to determine a city’s competitiveness. But today, how much the city provides safe and comfortable walking environment is becoming more important. Urban planners from many cities including Copenhagen, London, Paris and Barcelona prioritize pedestrians, and develop diverse ideas about how to make a walkable city. Seoul is also in line with these global efforts. 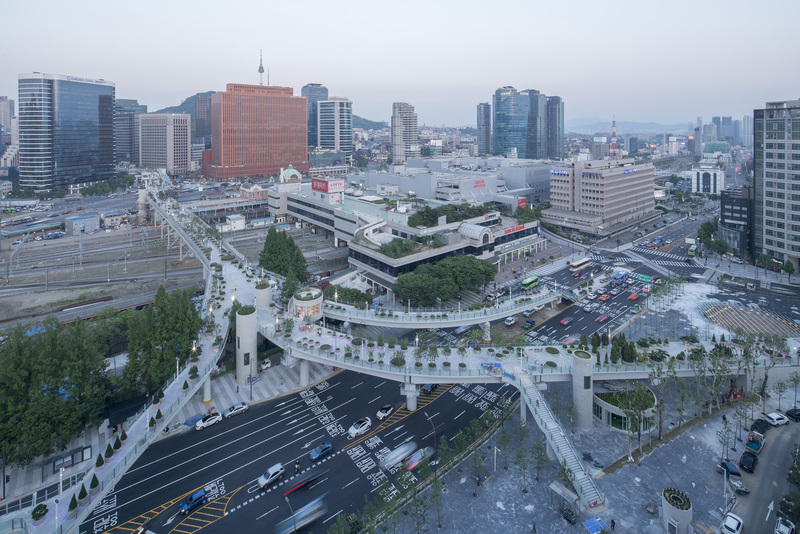 As the capital of Korea, Seoul has developed and implemented policies to create more pedestrian roads and to make urban regeneration through this. 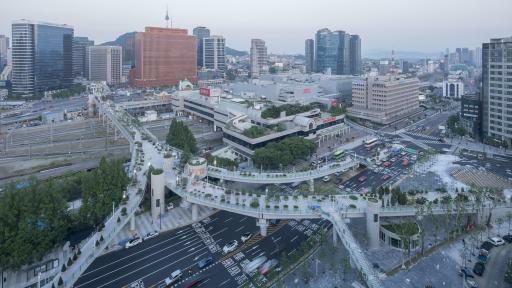 Among others, Won-Soon Park, Mayor of Seoul, is in the lead to transform Seoul into a walkable city. 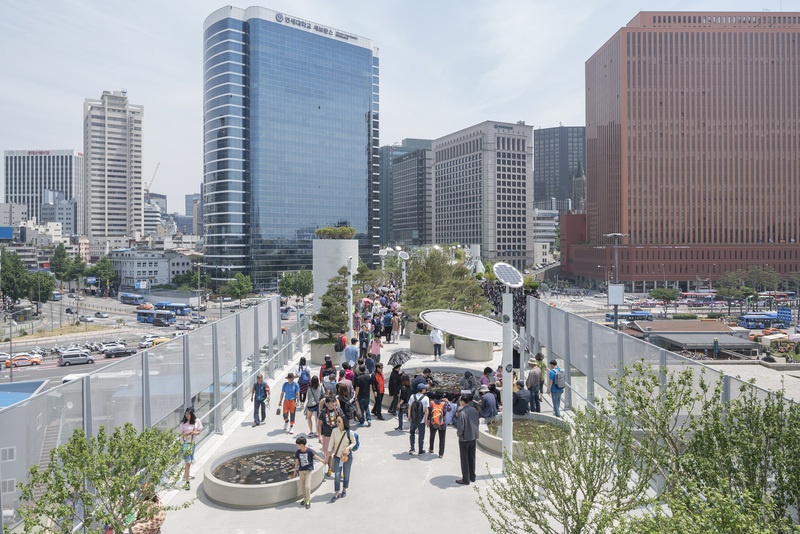 One of the recent successful accomplishments made by Seoul is “Seoullo 7017.” It is a 1,024-meter-long elevated pedestrian walkway opened in downtown Seoul as of May 20, 2017. It was built on the overpass that had served as a driveway for the last 45 years. Since its official opening, over 5,000,000 people have visited the Seoullo 7017. An average of 40,000 citizens and visitors hit this road a day. 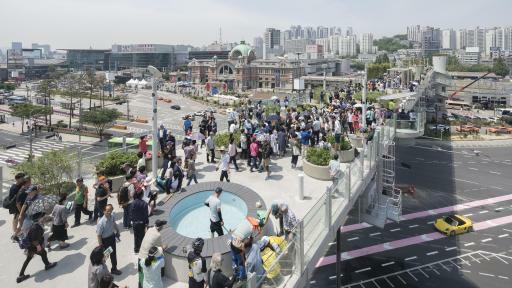 Seoullo 7017 is now the representative place for Seoul’s walkable city initiative. 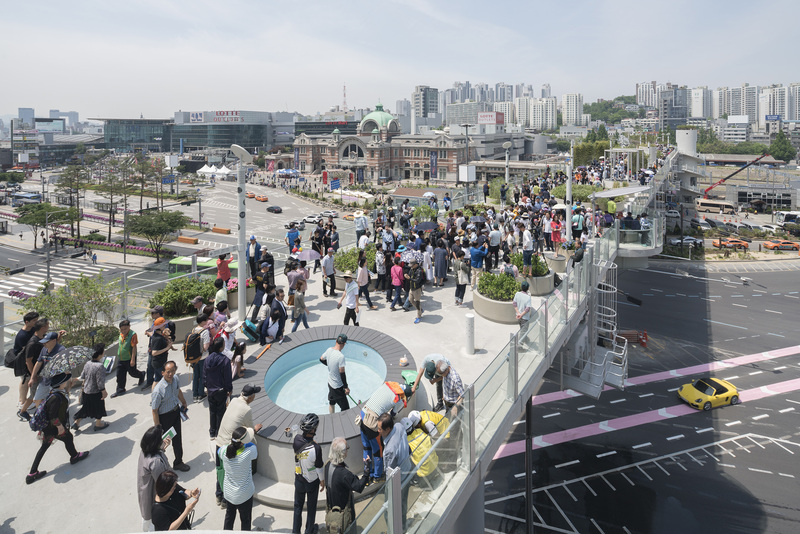 Nearby areas of the Seoul Station, where the Seoullo 7017 is passing by, is a major gateway to/from Seoul where about 390,000 commuters and travelers on average every day visit. However, the area has long been isolated like an island, surrounded by roads for cars. Despite it is located in the very center of Seoul, it has been underdeveloped compared to other surrounding areas such as Gwanghwamun, Yongsan, and Mapo. The residents living in this area had suffered inconveniences due to the deterioration of the residential environment and lack of infrastructure. Instead of the demolition of the overpass, the city regenerates it to create a pedestrian road and provides the right to walk to its citizens. Now Seoullo 7017 is serving as the transportation center of the Seoul Station area by connecting the east to the west and also connecting nearby tourist attractions such as Sungnyemun Gate, Myeong-dong, and Namdaemun Market. 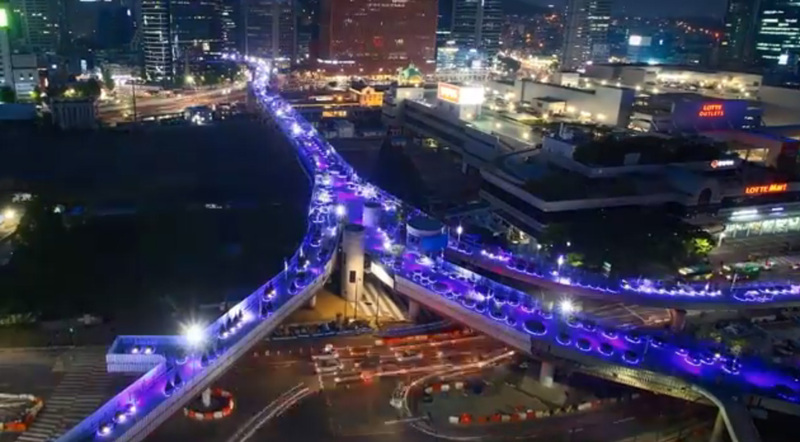 Meanwhile, “7017” in the name of Seoullo 7017 stands for “1970,” the year the overpass was built, and also “2017,” the year of its rebirth as a pedestrian walkway to emphasize its historic meaning of the road. It also refers to 17 connected paths and the height of the road, which as 17 meters. The Seoullo 7017 project began with the idea that beauty cannot exist without memories of history. Through Seoullo 7017, Seoul is seeking for regeneration instead of reckless development in its urban development, and preserving memories and history of Seoul. For the Seoullo 7017 Project, the city held an international design competition in January 2015, and selected the design submitted by Winy Maas as the winning one. Winy Maas is a world-renowned architect and won the Amsterdam Art Prize in 2004. Some of his famous architectures include Maquinnext (2012) in Barcelona and Market Hall (2014) in Rotterdam. One of the interesting things about Seoullo 7017 is that it regards the road as one big tree with its ramps as branches. Its 17 paths are organically connected, creating a network of the area. The vision and strategy of the Seoullo 7017 that transform a concrete structure into a space full of life have been praised for being future-oriented and innovative. Approximately 24,000 trees and plants of 240 species and 50 families endemic to Seoul and capable of growing on artificial ground are planted in order according to their Korean name along the Seoullo 7017. In addition, information centers, souvenir shops, cafes, bakery shops, restaurants and exhibition halls are located on the road for the citizens and visitors. 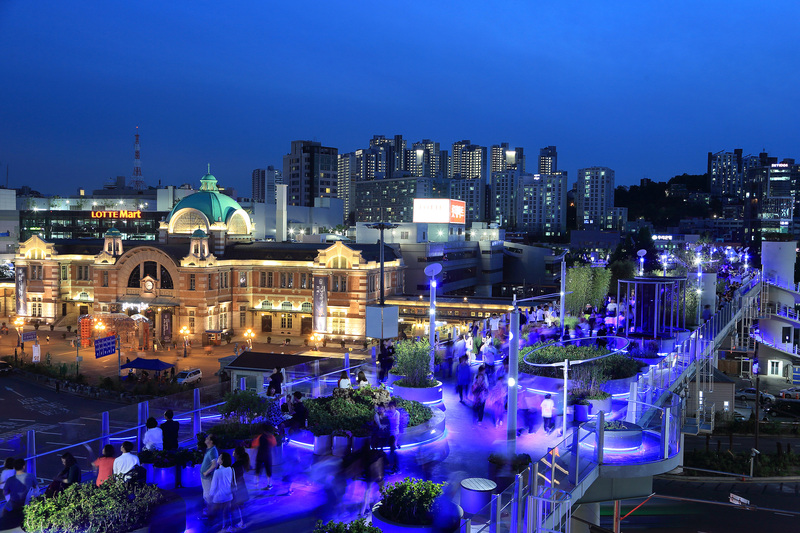 Four balconies standing 17 meters above the ground provides a panoramic view of downtown Seoul, and the glass-made Skywalk is installed to allow visitors to enjoy a new landscape of Seoul. “We decided to regenerate the years-old overpass, instead of tearing down it. 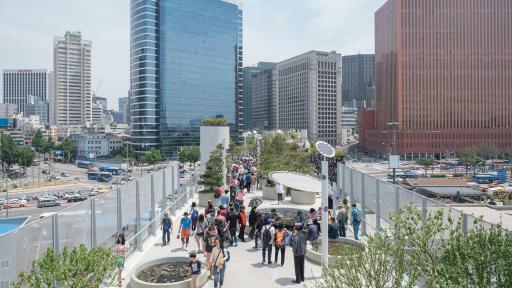 The new pedestrian road is a new attempt to revitalize the underdeveloped downtown area and its surroundings,” said Mayor Park. 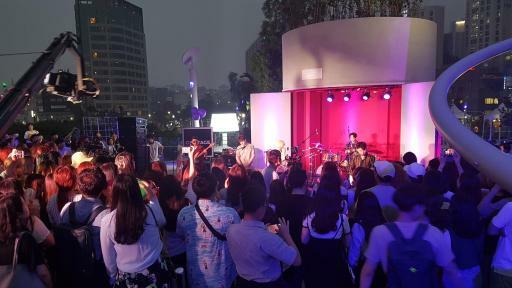 He also added, “We will make efforts to make the Seoullo 7017 a place where people gather, which will play a role of catalyst for the renewal and revival of the surrounding area.” For more information, visit http://seoullo7017.seoul.go.kr.